Deep in the forest the cold wind blows while bear cuddles under his warm quilt in for his long winter nap. He closes his eyes, and tosses and turns but sleep eludes him. His friends become alarmed and rally around to help get him to sleep. Mouse serves mint tea. 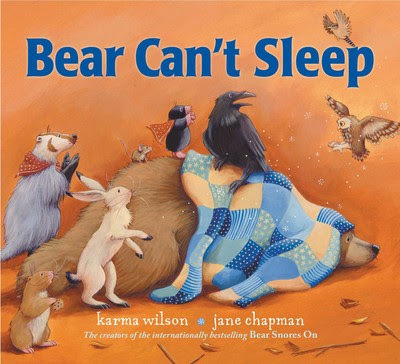 Hare offers warm milk and Badger builds a toasyt fire but "Bear can't sleep." Perhaps Gopher and Mole can something that will get bear to sleep. Wren, Owl and Raven join the others to no avail. That is until they put their minds together. Will they formulate a successful plan to get Bear sleeping through the winter. The darling illustrations make it too irresistible not to pause on each page. The lolling rhyme will have the young reader drowsing off as soon as Bear finds a solution. A delightful read aloud that even parents will love reading over and over again. What wonders would the world hold if one day you woke up not knowing who you are? When a boy wakes up on the beach in a world he doesn't recognize, he struggles to discover why he's there and who he is. Food and water comes easily to him but his bigger desire to know his place in the world doesn't come easy. An eerie feeling for a young boy. It doesn't help that an unknown voice occupies his mind. A voice he nicknames "the bully" because of the negative thoughts it fills his brain. As if the bully isn't bad enough, a monstrous beast sits ready to devour him if the water doesn't pull him under first. The boy focuses his energy into building a boat in an attempt to get back to his parents. 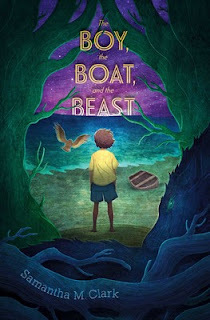 The boy's adventure captivates the reader though the melancholy tone makes for slower reading. Perhaps slowing down is a good thing as it helps the reader catch the allegories of the story and appreciate the lyrical writing. A solid fantasy for those who love solving mysteries.